Werewolf is a pretty simple game for a large group of people (seven or more.) It requires nothing more than players and a few pieces of paper. Once you got the players and the paper then get yourself ready for some accusations, lying, bluffing, second-guessing, assassination, and mob hysteria. Party!! Get a group of players. An odd number is best, although not absolutely necessary. There should be at least seven players; nine or eleven is better (or more if you can them). Shuffle the cards and hand them out, face down. Each player should look at his card, but must keep it secret. Only the narrator reveals his card and shows himself to be the narrator. Two players are now secretly werewolves. They are trying to slaughter everyone in the village. Everyone else is an innocent human villager; but one of the villagers secretly has the Second Sight, and can detect the taint of lycanthropy. The game proceeds in alternating night and day phases. We begin with Night. At Night, the narrator tells all the players “Close your eyes.” Everyone should. The narrator says “Werewolves, open your eyes.” The two werewolves do so, and look around to recognize each other. The narrator should also note who the werewolves are. The narrator says “Everybody open your eyes; it’s daytime. 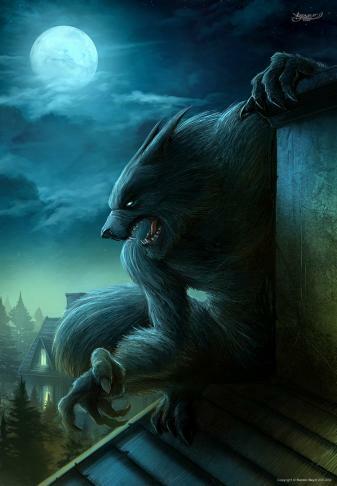 And you have been torn apart by werewolves.” He indicates the person that the werewolves chose. That person is immediately dead and out of the game. He reveals his card, showing what he was, and leaves it face-up. Now it is Day. Daytime is very simple; all the living players gather in the village and lynch somebody. The mob wants bloody justice. As soon as a majority of players vote for a particular player to die, the narrator says “Ok, you’re dead.” That player then reveals his card, and the rest of the players find out whether they’ve lynched a human, a werewolf, or (oops!) the seer. There are no restrictions on speech. Any living player can say anything he wants — truth, misdirection, nonsense, or bareface lie. Contrariwise, dead players may not speak at all. As soon as the sun comes up and the narrator indicates that someone is dead, he may not speak for the rest of the game. No dying soliloquies allowed. Similarly, as soon as a majority vote indicates that a player has been lynched, he is dead. If he wants to protest his innocence or reveal some information (like the seer’s visions), he has to do it before the vote goes through. No player may reveal his card, to anyone, except when he is killed. All you can do is talk. Once a player is lynched, night falls and the cycle repeats. Everyone closes their eyes, the werewolves (or werewolf) secretly select someone to kill, the seer (if alive) secretly learns another player’s status; then the sun rises, one player is found dead, and the remaining players begin to discuss another lynching. Repeat until one side wins. The humans win if they kill both werewolves. The werewolves win if they kill enough villagers so that the numbers are even. (Two werewolves and two humans, or one werewolf and one human.) At that point they can rise up and slaughter the villagers openly. When everyone closes their eyes at night, it is best for people to also start humming, tapping the table, rocking back and forth, or some such noise. This will cover up any accidental sounds that are made by the werewolves, the seer, or the narrator. The narrator should stick to the script to avoid mistakes or clues. If he says “Open your eyes, werewolves” instead of “Werewolves, open your eyes,” a player may misconstrue the command before the last word. The narrator should be careful to always talk towards the center of the group. If (for example) he turns to face the seer when he says “Seer, select someone,” the werewolves may detect the change in acoustics. It is really important that dead players not speak, and the narrator not speak outside his official capacity — even to correct a blatant misstatement about a matter of record. But more importantly, the humans’ chances are significantly weaker when there are an even number of players (including the narrator.) This is probably because an even game always ends with a nighttime murder, and an extra murder is always to the advantage of the wolves; whereas an extra daytime lynching could help either side. You can make your cards special if you like, make them more than a scrap of paper. Make them artsy or whatever. There area few other ways to play the game but this is the main way. Now go play.